An Israeli court on Sunday convicted Palestinian activist Bassem Tamimi of dispatching stone-throwers and protesting illegally, in a case closely watched by the EU. But he was cleared of two more serious charges, including incitement and perverting the court of justice, according to an AFP correspondent who attended the hearing at Ofer military court near Ramallah. “I decided to convict you on two of the charges against you: the charge of sending people to throw stones, and holding a march without a permit,” said the judge, Major Eti Ador. “I am clearing you of incitement and of perverting the course of justice,” she said, indicating the sentencing process would begin on May 24. Tamimi, 45, was charged with soliciting stone-throwing based on evidence that he directed such incidents from the roof-tops. He was arrested on March 24, 2011 and accused of organising illegal gatherings and incitement in connection with a series of weekly demonstrations in Nabi Saleh village in protest at Jewish settlers taking over their land. He was released on bail on April 24, 2012, after his elderly mother suffered a stroke, although he was kept under house arrest in Ramallah. Tamimi’s arrest sparked international condemnation with the European Union recognising him as a human rights defender, and Amnesty International declaring him a prisoner of conscience. Dressed in blue jeans, a black shirt and a black leather jacket, Tamimi stood impassively as the verdict was read out to the courtroom which was packed with European diplomats, NGO representatives, a handful of journalists and his wife, Nariman. “This court, the occupation and justice are parallel lines that will never meet,” he told AFP shortly after the hearing, looking tired and resigned. Jonathan Pollak, a veteran Israeli activist who has closely followed Tamimi’s trial, said the solicitation to throw stones was a lesser charge than the broader allegation of incitement, of which he was cleared. But in a court which almost invariably finds against Palestinian defendants, the fact that Tamimi was acquitted on two charges was verging on the miraculous, he said. “In a military court with a 99.74 percent conviction rate the very fact that he was even partially acquitted could be regarded a miracle,” he remarked. “However, he has already spent 13 months in prison for exercising his right to protest, based on the coerced confessions of minors,” he said. The military prosecution’s case against Tamimi was largely based on the testimony of two boys aged 14 and 15, although activists say their interrogation was fundamentally flawed and violated many of their rights as minors. 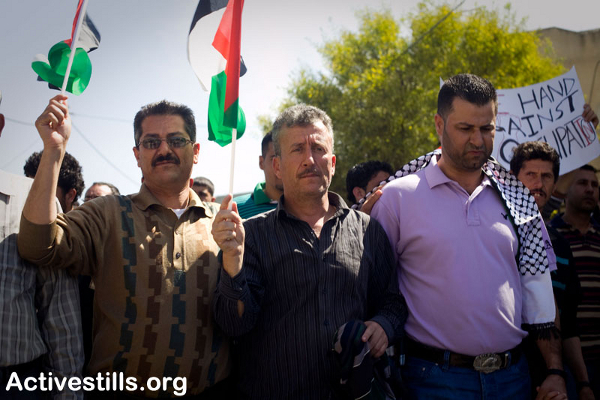 Besides being acquitted of obstruction of the course of justice and incitement, Tamimi was also acquitted of failure to attend legal summons, Pollak said. The trial has been closely watched by European officials, several of whom attended Sunday’s hearing. “We are here to be witnesses… to show solidarity. There is a great deal of interest in this case,” one of them told AFP, speaking on condition of anonymity. Speaking to AFP ahead of the hearing, Tamimi said he did not expect to receive justice. “He believes in passive resistance and says he never asked anyone to throw stones,” Habib said. The weekly demonstrations in Nabi Saleh began at the end of 2009, following a years-long legal battle with residents of Halamish settlement who in 2001 seized around 240 acres (100 hectares) of the villagers’ land. One Friday, the villagers accompanied the farmers to their land to help cultivate it but were prevented from getting there by settlers and the army. It soon became a Friday tradition, with the villagers routinely trying to reach the land and finding themselves blocked by the army, which says such demonstrations are illegal. Almost all demonstrations in the Palestinian territories are defined as “illegal” under Israeli military law, which states that any gathering of 10 or more people requires a permit.